That man. Yesterday, we saw that if anyone lacks wisdom, they should just ask God and He will give it. Yet here, it says that “that man” won’t receive anything. Read James 1:5-8. Ask in faith. Believe that God is going to do what He says He is going to do. It seens odd. Why would we ask God for something if we didn’t really think that He would do it? It almost amounts to saying “Hey God, if you can, would you please take care of this issue.” Instead, we should know and believe that God will do what He says. If we ask God to take and handle a situation and then go back and plan our own solution, we’re doing the same thing. Do we doubt God, or trust Him in all things. 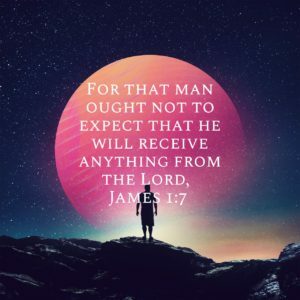 Don’t be “that man.” Trust God.